One can only hope that after the terrible 1998 version directed by Roland Emmerich the folks behind the new Godzilla film know what they are doing. They've certainly put a lot of great pieces in place, from director Gareth Edwards (who earned acclaim for his low budget sci-fi flick Monsters) to the awesome cast that includes Aaron Taylor-Johnson, Ken Watanabe, Elizabeth Olsen, Juliette Binoche, David Strathairn, Sally Hawkins, and Bryan Cranston, so the remake certainly has potential. And looking at the brand new behind-the-scenes image suggests that they will be aiming to do the property justice in terms of scale as well. 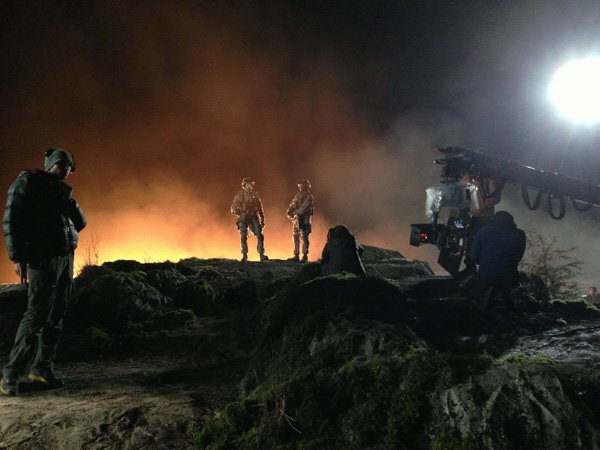 The shot seen above comes to us courtesy of the Legendary Pictures Facebook page, and while you can't really tell what is going on in the scene, it's fairly clear there exists a gigantic, smoking crater behind where the two actors (dressed as soldiers) are standing. Sadly the image's caption isn't very helpful either, simply saying "A look #behindthescenes at a Godzilla (2014) night shoot." The project was officially announced at last year's San Diego Comic Con after years of development, and has been in production since March. At this time we don't know anything about the film's plot or what will be going on with the human characters while Godzilla is rampaging, but the likes of Max Borenstein, Dave Callaham, David S. Goyer and Frank Darabont all took their cracks at the script. Godzilla is now less than a year away from release, with Warner Bros. planning to have it in theaters on May 16, 2014.